Keep your engine looking and running cool! JEGS Stainless Steel Radiator Hose Kits are available in a variety of colors and with or without end cap covers in 12", 24", 36", and 48" lengths. The rubber hose sleeve adapters and reducers allow the hose to be used with 1-3/4", 1-1/2", and 1-1/4" hose connections. 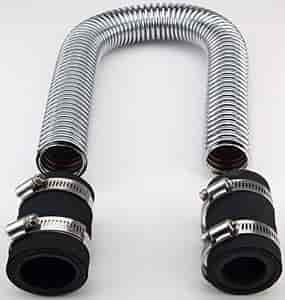 The flexible design allows the hose to be bent into many configurations. Can easily be cut for custom lengths. 12", 24 & 36" kits include 1 stainless steel hose, 2 end cap covers (excluding those sold without end cap covers), 2 rubber hose sleeve adapters, 4 rubber reducers, 4 hose clamps. The 48" kits include 1 stainless steel hose, 4 end cap covers (excluding those sold without end cap covers), 4 sleeve adapters, 8 reducers and 8 hose clamps. What you see in the picture is about as tight a radius as you will want to bend it. This natural this natural with polished ends, blue, black and also red. Nothing special you would need. Yes, these can be cut to size. Is it available in longer lengths? 3ft or 4ft.